By taking the sample test, you’ll quickly become familiar with the length and format of the exam. You’ll also begin to identify your strengths and weaknesses as a writer. The SAT always begins with the essay question and then offers several sections of math and reading questions. The Writing Test resumes in Section 4 or 5 of the SAT with thirty-five multiple-choice questions and then, after still more math and reading questions, concludes with fourteen additional multiple-choice questions on writing. This sample test, therefore, differs from a real SAT because the three sections of writing questions follow one after the other. Set aside an uninterrupted hour. Use a timer, a watch, or a clock to time each section. Work on only one section at a time. Don’t skip ahead to the next section before the allotted time is up. Don’t return to a previous section once it’s over. Mark your multiple-choice answers in pencil on the answer sheet provided. 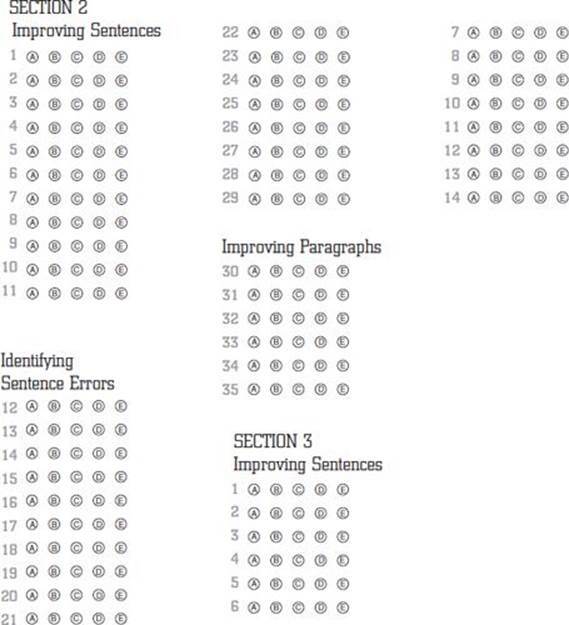 When you’ve completed the test, check your answers with the Answer Key and fill in the Performance Evaluation Chart. Your score on each section, along with your total score, will give you a profile of what you’ve done well and what you should study between now and SAT day. The chart will also tell you the types of questions you answered most successfully. Be sure to read the answer explanations for the questions you got wrong. On second thought, read all the explanations. You may pick up a pointer or two that will serve you well on future exams. Note that each question is rated by its level of difficulty—EASY, MEDIUM, or HARD. “Easy” questions are answered correctly by approximately 80 to 99 percent of students taking the exam. A “medium” rating suggests that more than 65 percent will answer the question correctly. And of the “hard” questions, fewer than 65 percent of test takers are likely to choose the right answer. In an ideal world everyone will answer all easy, medium, and hard questions correctly. In reality, however, that’s not going to happen. The SAT is a test, after all, that is meant to differentiate students from each other. If you make mistakes, learn from them. The answer explanations will direct you to relevant pages to study. Although it’s hard to assess your own essay objectively, don’t shy away from trying. Let the essay cool for a while—maybe a day or more. Then, reread it with an open mind and a fresh pair of eyes. Rate your essay using the Self-Scoring Guide. For a second opinion, find a trusted and informed friend—or maybe a teacher, counselor, or parent—to read, rate, and discuss your essay with you. Finally, convert your raw scores into the SAT’s 200–800 scaled score. Remember that your scaled score is only an approximation of what you might earn on an actual SAT Writing Test. Are you ready to begin? Good luck! Think carefully about the following passage and the following assignment. Whenever Social Studies teacher Karen Greene sits down to grade a stack of papers, she wonders whether the grades convey useful information about student learning to the students themselves, to parents, counselors, or even to colleges. While most would agree that grades provide a sort of feedback on student performance, finding consensus on the criteria to use for grading is a different story. Should Karen reward high grades to diligent, hard-working students with very low skills and limited achievement? Or should she risk discouraging such students by giving them the Ds that their work really deserves? What about grading students capable of doing excellent work when they put their mind to it but who rarely bother? An F for lack of effort might prod them to try harder, but would it accurately reflect the real quality of their work? Assignment: Should students who work very hard in a course earn very high grades, or should achievement rather than effort determine students’ grades? Plan and write an essay in which you develop your point of view on this issue. Support your position with reasoning and examples taken from your observations, experience, studies, or reading. Directions: The underlined sentences and sentence parts below may contain errors in standard English, including awkward or ambiguous expression, poor word choice (diction), incorrect sentence structure, or faulty grammar, usage, and punctuation. Read each sentence carefully and identify which of the five alternate versions most effectively and correctly expresses the meaning of the underlined material. Indicate your choice by filling in the corresponding space on the answer sheet. Choice A always repeats the original. Choose A if none of the other choices improves the original sentence. 1. The Broadway tradition of “musical comedy” has changed over the years because of their stories and music exploring serious themes, especially the consequences of war, tyranny, and death. 2. Mr. Rich was not the first math teacher to entertain and inspire his students, but he has been the first who turned math class into a party. 3. Our interscholastic athletic schedules were made too recklessly, without sufficient planning behind it. 4. Many senior citizens are reluctant to go online, it results from not knowing much about computers and being a bit scared of it. 5. The program of extracurricular activities were cut from the school budget in spite of them being regarded as one of the most important aspects of high school. 6. As modern astronomy increasingly employs sophisticated space telescopes, high-speed computers, and years-long probes into outer space, humankind’s concept of the heavens has changed. 7. Although whales can grow bigger than houses, they have ears so small that you can’t clean them out with an ordinary Q-tip. 8. When the baseball rulebook is followed too closely, they often spoil instead of enhancing the game. 9. At the airport passengers must pass through metal detectors, but there are not frequent body searches of passengers. 10. The students of Campolindo High show as much school spirit as any other school. 11. Inside Margaret Jackson’s home were an art studio with a pottery kiln, high-tech stainless steel appliances, and there was a swimming pool lined with Italian marble. 12. Although he left Texas a small boy, Jim returned he was sixteen that he’d the rest of his life there. 13. the constant pressure of schoolwork and sports, Terry more than , in her senior year. 14. the beginning of the play, two puzzling dilemmas that Medea must must solve she is her ordeal. 15. The common sentiment that hard work doesn’t a frail old man has a heart condition and a long driveway to shovel after a snowstorm. 16. decades, scientists analyzed masses of public-health statistics found a high correlation heavy smoking and the incidence of lung cancer. 17. Saturday’s game why Paulie, one of the players, is being recruited colleges. 18. every road in the town is now paved, there are some residents that the dirt roads be preserved. 21. Many of the candidates, including the incumbent senator the legislation the ban in Yellowstone and other national parks. 24. Some symbols a some others personal, some contradictory, conflicted, ambivalent. 25. Since the early 1800s, the famous Hope Diamond the most notorious gem leaving behind have suffered one misfortune after another. 27. Lady Gaga and Beyoncé popular singers, but Beyoncé has the number of fans. 28. During this past year, a rapport between my Spanish teacher I now call her first name, Louise. No student of American history can avoid having learned about a great technological feat, the building of the transcontinental railroad in the middle of the nineteenth century. Though the Pacific Ocean could be reached by traveling overland in wagons or by sea via South America, many dreamed of a time when the East would join the West, linked by a transcontinental railroad. In 1869, the dream became a reality. It was a great physical achievement. In accomplishing this great feat of engineering, the workers were exploited, and many of them died. Chinese immigrants were the backbone of the workforce. They performed unskilled labor and also the highly specialized and dangerous jobs as well. The workers were exploited ruthlessly. Methods were unsafe and cost lives. Baskets holding a single person were lowered down the side of a mountain, and the worker inside would place dynamite into the mountain’s crevasse, light it, and try to make it back up. If they were not pulled fast enough, or the rope broke, they fell to their deaths. An estimated 1200 Chinese perished just so. With the help of the U.S. government, which contributed millions of dollars’ worth of public land and funds for construction, the project was run by a group of four well-to-do but corrupt businessmen from California. They used fraud to build their own personal fortunes, and their greed ran rampant. 30. Which of the following is the best way to deal with sentence 1 (reproduced below)? No student of American history can avoid having learned about a great technological feat, the building of the transcontinental railroad in the middle of the nineteenth century. (B) Switch its position in the essay with that of sentence 2. 31. In context, which of the following is the best way to revise the underlined words in order to combine sentences 4 and 5? It was a great physical achievement. In accomplishing this great feat of engineering, the workers were exploited and many of them died. 32. Which of the following ideas best alters sentence 9 in order to link it to sentence 8? 33. Which of the following best describes the relationship between sentences 9 and 10? (A) Sentence 10 provides material that illustrates the statement made in sentence 9. (B) Sentence 10 proves the validity of the point made in sentence 9. (C) Sentence 10 introduces sources of information that confirms the truth of sentence 9. (D) Sentence 10 offers an alternative point of view about the point made in sentence 9. (E) Sentence 10 restates opinions expressed in sentence 9. 34. Which of the following would be the best sentence to insert before sentence 13 to introduce the last paragraph? (A) Building the railroad was such an expensive undertaking that no private individual of that era could afford to finance the whole thing. (B) Paying for the construction of the railroad left the federal government with a mountain of debt. (C) One set of construction crews started building from the east to the west, while another began in the west and built eastward. (D) The building of the railroad was indeed an American milestone. (E) The Pacific Railroad Act, a document rushed through Congress, was grossly over-generous in its benefits to the builders. 35. What material is the most appropriate to add immediately after sentence 14? 1. Tony showed three college acceptance letters to his counselor, he said that NYU was definitely his first choice. 2. Many problems among the faculty developed after Mr. Atkins took over as principal of the school; these problems diminished both the reputation and the performance of the school. 3. Despite being called “reality” television, the program about the plane crash in the Rockies seemed about as real as a cow jumping over the moon. 5. At the beginning of Joseph Conrad’s story “Gaspar Ruiz,” a soldier has been falsely accused of cowardice under fire, desertion of his post, and he gave military secrets to the enemy. 6. Essential for doing business or just staying in touch with family and friends, cell phones, they are increasingly popular. 7. Drive-in restaurants that serve fatty food can be found along almost every main highway in the country, this explaining why so many Americans are overweight. 8. When you read at a very fast rate, your eyes often skip words, and your mind grasps the meaning nevertheless. 9. The author, guiding the reader through Emma’s most intimate dreams and fantasies, accurately portraying the plight of many middle-class women in France in the 1850s. 10. The custom of naming ships after dead war heroes has been practiced through many countries in honoring their military personnel. 11. In 2011, the cost of college tuition increased considerably, while continuing to grow in 2012. 12. The Black Death of the fourteenth century, possibly the world’s deadliest epidemic, whose origin is thought to be central China. 13. Before going on the senior class trip, a parental permission slip must be filled out for each student. 14. Residents of Chicago have just as much right to complain about the cold as the city of Minneapolis, which endures sub-freezing temperatures most of the winter.